It is easy to take for granted the improvements to our current produce selections made possible by decades and centuries of careful observation by farmers, nurserymen, plant breeders and even plant hobbyists. Saturday, on my way home after checking out the latest Nashville Hot Chicken pop-up by Barts' BBQ, I stopped @ Vallarta Markets, a regional ethnic grocery chain located primarily in the San Fernando Valley. 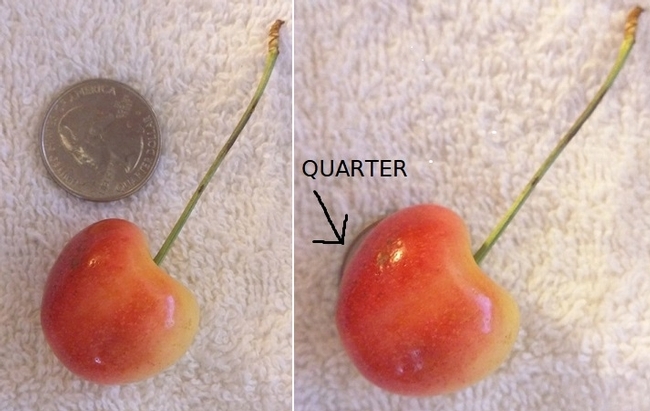 Rainier cherries @ $2.99/lb. A great price considering most retailers hold the line @ $5.99/lb, occasionally dipping to $4.99/lb. The market was 4 pounds lighter upon my departure. Plump, juicy, fresh, and larger than a quarter. The second picture has the quarter underneath the cherry. I wanted to process some pitted with the stems in a brandy syrup and some in a lightly spiced syrup. I was thinking I would expedite the process by breaking out an antique cherry stoner although I already knew the answer. NO! Cherries in the early 1900's were significantly smaller and the bulk of preserved cherries, canned and dried, were sour Early Richmond , English Morello, or Montmorency cherries. 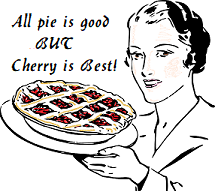 Once preferred for jams, jellies, preserves, pies, syrup, pastries and cakes, sour cherries are not the retail force today that they were in an earlier era. When we think of cherries today, most people dream of Bing cherries or its offspring, big, dark burgundy red, and sweet. BTW, the Bing cherry was named for Chinese national, Ah Bing, a decade's long employee who worked in the orchards of Oregon horticulturist SethLewelling.Ah Bing returned to Manchurian China in 1889 to visit family and due to the Chinese Exclusion Act of 1882 was never allowed to return. 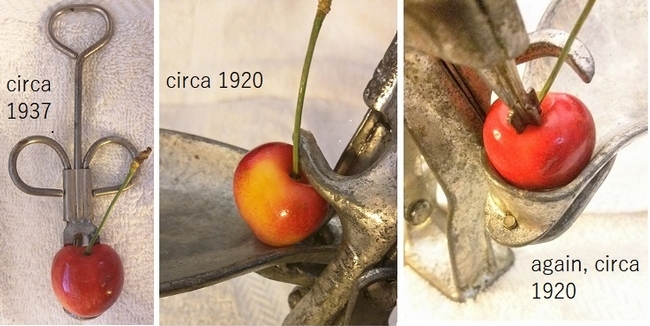 My Rainier cherries would not fit in a finger operated cherry stoner, patented in 1937 by J.C. Brown. They would not feed into a 1920's, No. 50 cherry stoner by the New Standard Corp. of MT. Joy, PA. However, I could hand position each cherry individually in the well below the plunger. Say “goodbye” to speed and efficiency. 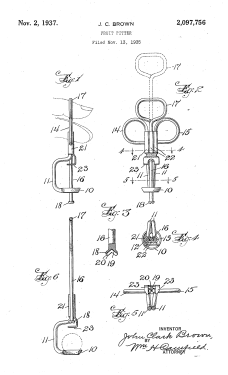 I love the ingenuity of early mechanical marvels, designed without Cad-Cam computer programs, CNC machinery, or 3-D printing. Each design had to be mocked up by pattern makers, a specialized form of woodworking, and made into casting patterns for the foundry to cast the item in molten iron. Patterns had to be made oversize (6-9%) to account for the percentage of shrink as the cast iron cooled. My cherry canning project is on temporary hold due to the rapid disappearance of the fresh cherry stock from my refrigerator. It occurred to me that this is the reason why I never have any preserved cherry items to enter into the county fair. Handful here, bowlful there, then death by attrition. It's the pits (pun intended).